Soil pH is a measurement of the alkalinity or acidity of soil and is measured on a scale of 1-14, with 7 as the neutral mark. Any measurement below 7 is considered acid and anything above 7 is considered alkaline. Acid soils are often referred to as "sour" and alkaline soils as "sweet." A pH of 5.5 is 10 times more acidic than a pH of 6.5. Conversely, a pH of 8.5 is 10 times more alkaline than a pH of 7.5. Technically, pH is a gauge of the hydrogen-ion concentration in the soil. However, for the gardener's needs, it is enough to know whether your soil is alkaline, nuetral or acid because certain nutrients plants need to thrive can only be absorbed by the plants roots when the soil pH falls into a certain acceptable range, which depends on the specific needs of a particular type of plant. In Wilson Bros Gardens you'll notice that we list the soil pH needs under the Description tab on every plant page in the site. You might also notice that the specific soil pH needs of many plants and trees ranges between 6 to 7.5 on the pH scale. Many average garden soils also fall within this range. That being said, there are some types of plants such as azaleas, blueberries, camellias, and gardenias, which prefer a highly acid soil with a pH ranging between 4 to 5.5 on the pH scale. If the soil is too alkaline, or "sweet," the foliage of these acid-loving plants may develop chlorosis (turn yellow) or will not produce flowers or fruit as well, if at all. 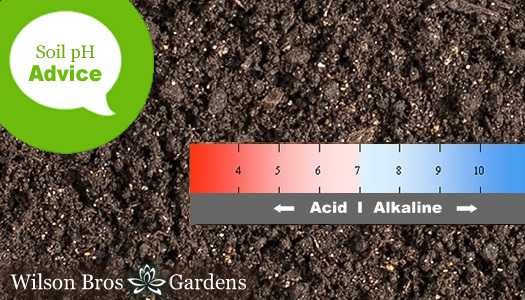 While many garden soils are slightly acidic to neutral or slightly alkaline, some soils are very acidic or alkaline. If more alkaline, this is due mainly to the limestone parent material from which the soils were formed. In addition, home builders may remove topsoil during construction and replace it with more alkaline subsoil. Alkaline building materials, such as limestone gravel and concrete, and high pH irrigation water may also contribute to a soil's alkalinity. If you're unsure about the pH of your soil and whether or not it's suitable for growing the specific types of plants you intend to plant, it's a good idea to test the soil pH in the planting area. You can quickly test soil pH with an inexpensive soil pH tester probe or test kit. To raise the pH (make more alkaline) you can apply a pelletized limestone product such as LimeLite to the soil. If your soil is too alkaline (sweet), you can lower your soil's pH (make it more acid) by using several different products. To lower the pH you can apply Soil Sulfur, Aluminum Sulfate, or Chelated Iron. Adding organic compost to the soil or using compost as mulch can also help to increase acidity and maintain acid soil conditions. Soil Sulfur is the best, safest, least expensive of elements, however it is the slowest acting product to use when attempting to lower your soil's pH. Aluminum Sulfate and Chelated Iron react more quickly with the soil than Sulfur. However, these elements must be applied at a 5 to 6 times greater rate. Research suggests that wood mulch or compost as a surface mulch may actually allow greater nutrient absorption by some trees. So, after planting a shrub or tree, spread a layer of mulch about two inches thick from near the base of the plant to just beyond the dripline (outer mkost branches). Each spring add more mulch to keep the depth at about two inches. Note: If the pH of your soil is greater than 7.5 (very alkaline), then the soil may contain a large amount of free calcium carbonate. This compound strongly resists changes in soil pH. Lowering the pH becomes difficult or impractical on soils that have a pH above 7.5. The pH of highly acidic soils can be raised, or made more alkaline, by incorporating limestone into the soil. There are new, specially formulated lime products, such as LIME RITE, that are 5 times stronger that standard pelletized lime. You can use these fast-acting limestone products at 5 times less the application rate of standard pelletized lime. Wood ash will also raise the soil pH, making the soil more alkaline. Do not apply wood ash, limestone, hydrated lime, or other liming materials to alkaline soils. Modifying a soil's pH is usually a slow process and may require repeat treatments. It is often most effective to use a combination of treatments. However, don't expect a quick fix or a miracle cure. We hope this info was helpful!